If you are restoring a car the most important thing you can do is purchase an Assembly Manual and then spend some time studying it. These are the actual drawings that were referenced by assembly line workers while the cars were being produced. These manuals not only show the parts and part numbers, but often show letter codes, colors, paint stripe identification colors and locations, and the proper routing of parts. They show when the various production plants substituted different parts, and also list their respective part numbers. They can also answer questions regarding apparent discrepancies between different factory reference books; I will go into this later. With a little bit of detective work, you can even get an idea of what parts were brought into the plant as sub-assemblies and from this infer how these parts were painted before being installed. The one major drawback is that the manuals available to us as reproductions are often incomplete, and many are the original issue documents, or are early in the production year, so all the pages/revisions are not available. Even so, there is an incredible amount of info that can be gathered, and hours and hours of time that can be saved by installing the parts in the right order and routing them correctly the first time. There is nothing more aggravating then having to take apart a freshly painted assembly because something else had to be done before it was installed, believe me, I have been there. One of the biggest problems I see people having with these manuals is understanding revision dates, and determining how they relate to their cars. Often restorers look at the sheets as pictures only, and assume that they accurately show the correct parts for their cars. The reality is very different; each drawing ONLY depicts the most up-to-date information. Changes occur throughout the production year, and as they occur the drawings are revised to correctly represent these changes. By understanding and using revision blocks we can see when these changes took place and know which parts are correct for our cars. I will give 2 examples that will help explain what I mean. 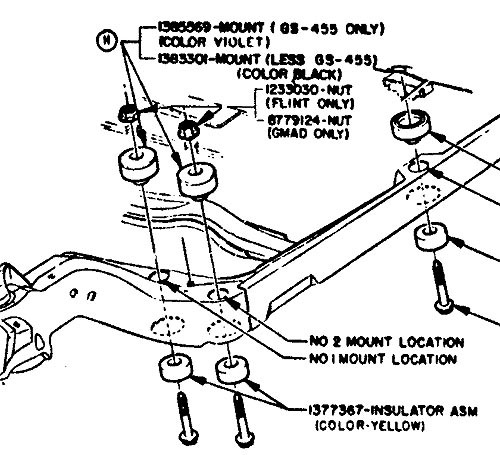 In the 70-assembly manual, page 2-3.1 lists the frame and body mount information for A-body Buicks. If you look at the revision block in the upper right hand corner, it lists Revision H, dated 12/12/69 as Color Orange to Violet. (See attached Chart) Now looking at the drawing and finding H you see it is referring to the body mounts at the firewall, and the color for these are Violet. (See attached Drawing) It is also important to note that revisions A thru G are now part of the drawing, so the only revision that is called out on the drawing will be the last one, in this case revision H. All earlier changes/revisions will only be listed in the revision block. 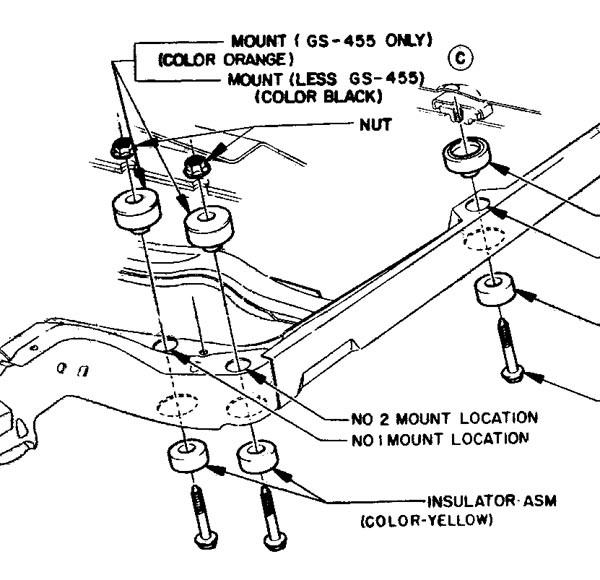 Now, if you go to page 20-7 in the 70 Chassis Service Manual, that was printed at the beginning of the production year, you will see the same drawing, but here it lists those same body mounts as Orange in color. (See attached Drawing) If you search that page for the revision letter you will find it is an earlier revision, namely revision C. 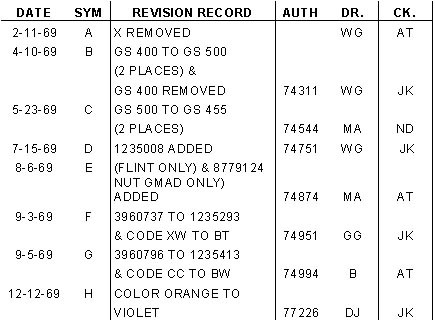 The assembly manual lists revision C as dated 5/23/69, so now you can see that the body mounts were originally orange, but changed to violet sometime after 12/12/69. Now I know this particular change is not important in the grand scheme of things, but you get the idea. Here is an important example from the 71-assembly manual. Pages 12-8.8 and 12-8.9 show the batteries and cables for 350 and 455 cars respectively. Both pages have revisions dated 2/22/71 that list changes for battery part numbers and note that the cables were also revised. Both drawings show side-mount batteries and cables, but if you look in the 71 Chassis Service Manual, that was printed at the beginning of the production year, on page 120-6, you will see they list that top-post batteries were standard equipment for A-body Buicks. This date of 2/22/71 is important because that was when the drawings show the batteries were changed from top-post to side-mounts. Now, I would like to add a few words of caution here, the above date is the date for that particular revision drawing. This does not necessarily mean that this change was implemented on this date, or that every production plant introduced the change at the same time. To assume something like that would be ludicrous. I work with drawings everyday, and while some are developed months in advance, others have your boss breathing down your neck, because they are needed right away. I am sure this was also the case when these drawings were being produced. What we can say for sure is that before 2/22/71 all batteries installed in A-body Buicks were of the top-post variety, and that sometime after that they were switched to side-mounts. The next revision date for these drawings is 3/22/71 and shows that the negative cable was rerouted due to a change in an Air Conditioning hose. From this we can further pinpoint the battery change to sometime between 2/22/71 and 3/22/71. To get closer to the actual date this change was implemented, you would need to look at original cars from that time period, but with cars being made at different plants I dont know how useful this would be. To sum everything up, using assembly manuals and understanding revision dates can save you both time and money. They not only help with installing parts correctly the first time, but also show which parts are correct for your car. If using an assembly manual stops you from buying just one incorrect part it can save you more then the $30.00 or so that they cost to buy. I hope this helps make your assembly manuals more useful for your restorations.